I think The Killers are a fantastic singles band - most of the the singles off 'Hot Fuss' were ace and 'Bones' is possibly the best thing they've done so far. The Tim Burton directed vid wasn't too shabby either. So it was pretty weird to discover that they've released an iTunes only single, in the form of a duet with Lou Reed - you know "oh it's such a perfect day". Or I guess you might know him from some tiny band called The Velvet Underground. 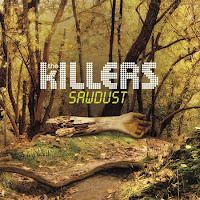 The song will be on a soon-to-be released b-sides and rarities compilation entitled 'Sawdust'. Admittedly, I wasn't expecting much from 'Tranquilize' (digital only singles can be a bit pap, although 'Stockholm Syndrome' by Muse was superb) but the interesting mish-mash of styles on offer make for an unexpected direction and great return. The song is a bit morose to say the least and adding Lou Reed's vocals only adds to that. Not that Lou Reed's the only non-Killers vocalist on the track with a squeaky kid (or kids?) making an appearance mid-song. 'Tranquilize' moves through pulsating, trancey keyboard bits to a folky chorus with the verses plodding along the way (although this helps emphasise the sentiment of the song). There's even a Joy Division-esque intro, although that's hardly the most surprising thing ever as they've done a cover of 'Shadowplay', also be appearing on the forthcoming album. All in all, a goodie. n.b considering this is a bit naughty, the mp3s will be removed by the weekend-ish. Get it now basically. And if you've come here too late, head over to iTunes and buy it. A couple of other things now; firstly, thanks again for voting in the BT DMA's if you did, this is the 44th best music blog in the universe apparently [link]. A bit down from last year but not bad going at all! Congrats to my fellow bloggers who made the list too. Secondly, my friends at Oops! are putting on a gig at one of my favourite London venues, Nambucca with Keep Hope Inside fave, Nic Nell. He's amazing live! And if that isn't good enough for you there's lots of other bands on the bill, including secret headliners. Ooh. That's all happening on October 23rd, for more details, head to their [MySpace].